On V-E Day, Eisenhower had sixty-one U.S. divisions, 1,622,000 men, in Germany, and a total force in Europe numbering 3,077,000.1 When the shooting ended, the divisions in the field became the occupation troops, charged with maintaining law and order and establishing the Allied military presence in the defeated nation. This was the army-type occupation. A counterpart of the military government carpet, its object was to control the population and stifle resistance by putting troops into every nook and cranny. Divisions were spread out across the countryside, sometimes over great stretches of territory. The 78th Infantry Division, for instance, for a time after V-E day was responsible for an area of 3,600 square miles, almost twice the size of the state of Delaware, and the 70th Infantry Division for 2,500 square miles. Battalions were deployed separately, and the company was widely viewed as the ideal unit for independent deployment because billets were easy to find and the hauls from the billets to guard posts and checkpoints would not be excessively long. Frequently single platoons and squads were deployed at substantial distances from their company headquarters. 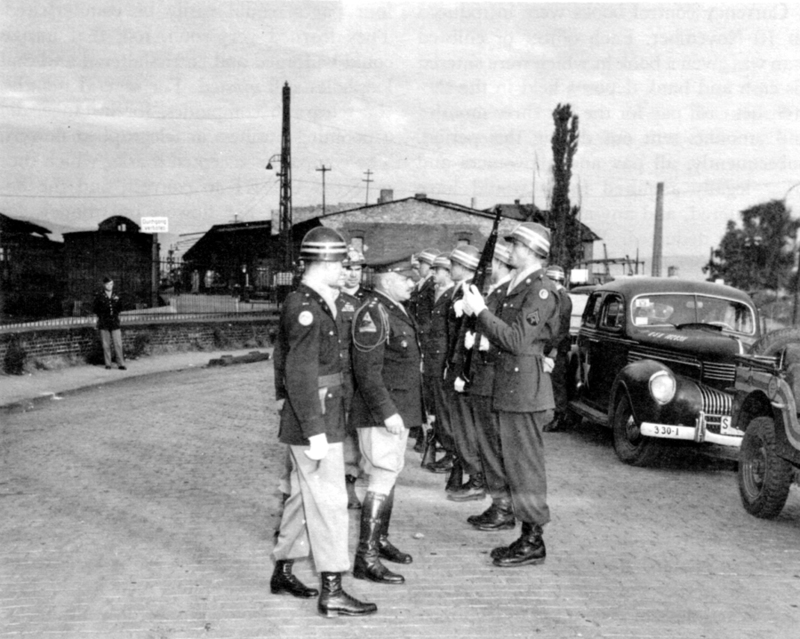 The occupation troops manned border control stations, maintained checkpoints at road junctions and bridges, sent out roving patrols to apprehend curfew and circulation violators, and kept stationary guards at railroad bridges, Army installations, DP camps, jails, telephone exchanges, factories, and banks. In the first months troops were plentiful and almost everything of importance-and some not so important-was guarded.2 In effect, the combat forces became military government security troops. 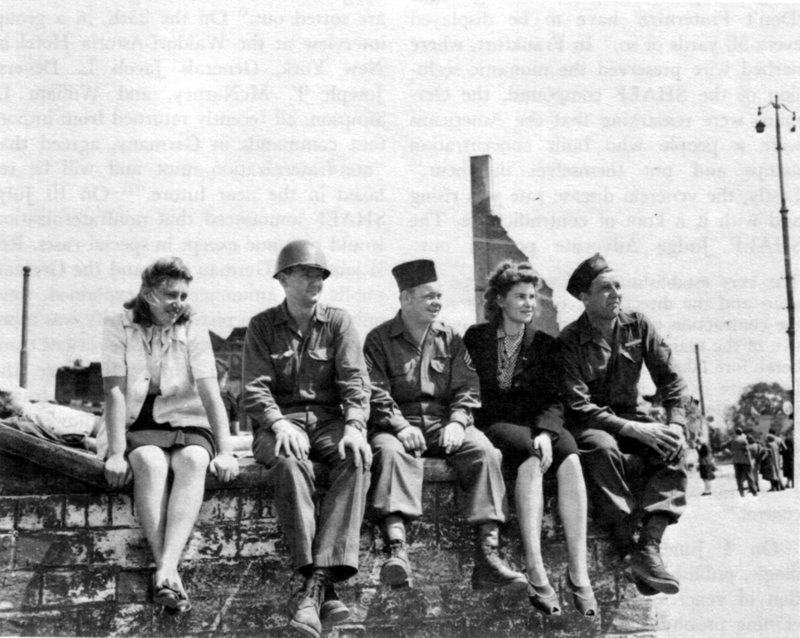 There was a new watch on the Rhine today -by handholding American GI's and German girls taking advantage of the relaxed restrictions on fraternization. Seventh Army reported an immediate free and open mingling of soldiers and German civilians and asked for clarification of the announcement because its commanders and MPs had no instructions concerning which types of contact were permissible and which were not. Wartime planning had assumed that a large part of the forces required to defeat Japan would come from Europe after hostilities ended there. In early November 1944, Lt. Gen. Brehon B. Somervell, Commanding General, Army Service Forces, had told Eisenhower: "The European Theater of Operations . . . will in fact become a base, the location of resources which we will wish to divert to use in the Pacific . . . . We are going to place immediate demands on you to put your machine in reverse and this at a time when you will have to be laying out your billeting areas, lines of communications, ports, railroads, and other facilities for your job of maintaining order in Germany." 30 Subsequently, with the Battle of the Bulge and the drive into Germany still months ahead, redeployment planning groups had gone to work in the Pentagon and at Headquarters, ETOUSA. It is becoming increasingly apparent that the task of readjusting the Army and promptly releasing to civilian life those people who are surplus to the needs of the Japanese war is one that will demand the most unselfish and conscientious efforts on the part of everyone. I fear that the weight of public opinion in the US will be such that unless the task is handled properly we may be forced to take measures that will interfere with redeployment and result in a prolongation of the Japanese war. men were going to have to wait months before their turns came. 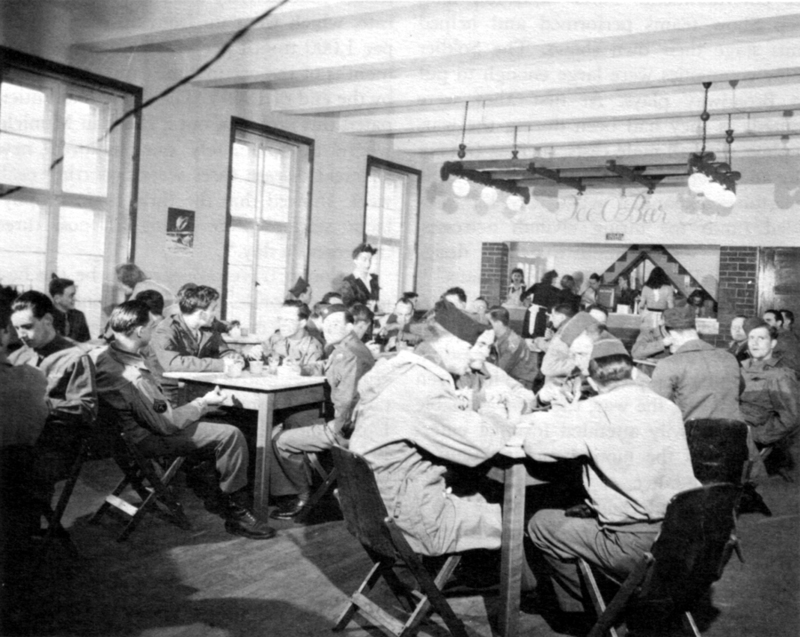 Since they could have constituted a monumental morale problem, especially while the nonfraternization policy was in force, the redeployment plans included provisions for training, education, and recreation programs throughout the theater. ICE CREAM PARLOR, intended to boost morale during redeployment and readjustment. Furlough travel appeared to be the best prop for morale. It offered contact with civilian society, relief from the military routine and the supposed strain of nonfraternization, instructive experience, and a taste (with a marked GI flavor) of what had formerly been the life of the privileged. Before V-E Day, ETOUSA opened the Riviera Recreational Area in southern France, with 18,000 accommodations at Nice (for enlisted men) and Cannes (for officers). Inexpensive tours in France, England, Belgium, Holland, and Switzerland were offered after hostilities ended. Paris attracted the most soldier-sightseers by far, and visits there had to be limited to forty-eight hours throughout the summer of 1945. The US zone in Germany, in spite of the war damage, offered a variety of tourist attractions. (A standard military government joke was that the Russians had received the agriculture, the British the industry, and the Americans the scenery.) 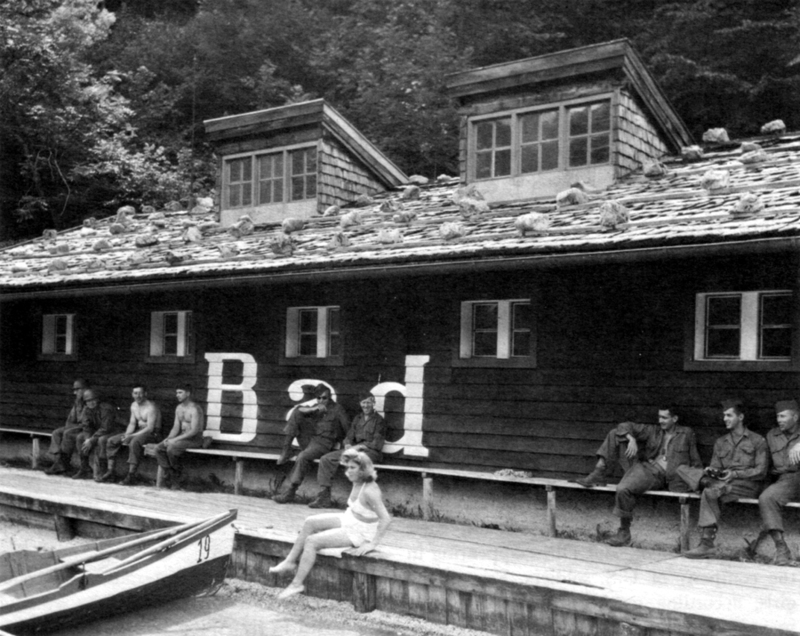 In the summer of 1945, USFET Special Services opened a rest and recreation center at Berchtesgaden that rivaled the one on the Riviera. Civilian guides conducted tours for three hundred men a day at Heidelberg. titude of things (including government property) that the Germans were willing to buy at black market prices, could convert the Allied military marks at ten to the dollar. Dealing in Reichsmarks, he soon learned, was only slightly more inconvenient. While the Reichsmarks could not lie converted directly, the G-5 Currency Section periodically put blocks of new Allied military marks into circulation and accepted Reichsmarks in exchange.63 Probably no army ever had so many successful "gamblers." They could hardly miss, of course, with the odds pegged at twenty to one in their favor. The answer-namely, to stop converting Allied military marks-was clear but not easy. The Allied military marks were evidence of US determination to administer Germany as a single economic unit. The Soviet Union, although it was not converting, had not repudiated the Allied military marks as the occupation currency; it had merely made the money practically worthless to its own troops. USFET could either do the same with readily predictable troop and press reactions-or adopt some other currency for its forces, thus leaving itself open to accusations of having been the first to break the principle of economic unity. The Russians, of course, could have raised the same charge if only their marks were not converted. Unfortunately, to preserve the principle, USFET had to ignore the fact that there was no other solution able to withstand the pressures, and ingenuity generated among the troops by the prospect of fantastic profits. man, Polish, Norwegian, Danish, or Dutch-could be substituted for American manpower in the police force and in the tactical units "to reduce requirements for US manpower and expense." Eisenhower accepted the idea of a police-type occupation but objected to using Germans on the ground of adverse public reaction, anticipated in both Europe and the United States. The War Department thereafter raised the possibility of recruiting other Europeans several times during the succeeding months before finally dropping the whole idea because of various difficulties, among them expense, language problems, and danger of increasing the pressure for the withdrawal of all US forces. 76 In the meantime, USFET undertook to devise a police-type occupation of its own. As late as mid-February 1946, however, the US Constabulary consisted only of a plan and a headquarters. When Maj. Gen. Ernest N. Harmon was appointed commanding general on 10 January, he was for a time the sole member of the constabulary. By mid-February, he had selected a headquarters staff; on the 16th, a constabulary school opened in the former Adolf Hitler Schule at Sonthofen to train members of a cavalry reconnaissance squadron as teachers for the main body of the constabulary yet to be assigned.